An IT freelancer – an expert in WordPress – is mildly frustrated with her situation. Her skill is in demand. She’s passionate about the work she does. Yet as a freelancer, her income is limited by the amount of hours she can work. She has enough demand to justify starting her own agency. Create jobs and all that. No deal. Doing so would shift her role from production to sales and business development. “I would have mouths needing feeding,” she says. Not wanting that, she trades limited income for freedom that could eventually come from building something big. Millions make this trade every day. Except it’s the other way around. We trade freedom for limited income. We hope that income affords a future time when when we trade job for freedom. Meantime, we put effort into jobs in return for income to pay bills, keep homes, educate and feed kids. Precious few dollars go towards retirement. Modern civilizations limit choice. 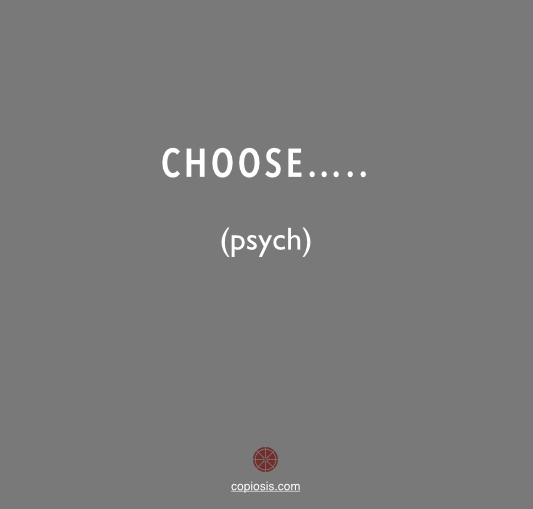 In many instances, where you think you have choice, there is none. We can have it all: freedom, great income and plenty of time to do what we want. That’s not reality today. It will be. You’ll still have to choose. Only the options get much better. And your freedom to choose will be real.